Former professional hockey player Gordie Howe earned the fame of being the most durable player of all time, playing twenty-six seasons for five decades in the National Hockey League. During that time, he was one of the game's most productive scorers. Gordie Howe was born in Floral, Saskatchewan, Canada, on March 31, 1928. He was the fifth of nine children. At three months of age his family moved to nearby Saskatoon, where his father worked as a mechanic, a laborer, and a construction worker to support his family. The family was poor, as were many of their neighbors during the Great Depression (a period in the 1930s where economic hardship led to a lack of jobs, and the majority of the people in the United States and Canada were living in poverty). As a result Gordie was often sick as a child because of poor nutrition. He was also painfully shy and awkward—a problem that he would face throughout his adulthood. Gordie's significant moment came when a neighbor sold a sack of used belongings to his mother for cash. When they opened the bag, the first thing that he saw was a pair of skates. Five-year-old Gordie had received his first pair of skates. Howe immersed himself in hockey, playing day in and day out throughout the year, using a puck, a tennis ball, or even clumps of dirt. He was a big boy but was clumsy in his youth. He did not make it the first time he tried out for a local youth hockey team. By the time he was twelve years old, however, Howe had developed into an excellent skater. During the summers, Howe worked with his father at construction sites. He described it as "throwing concrete." The heavy work helped him develop the exceptional strength that he would one day use to make himself one of the fastest shots in hockey. At the age of fifteen Howe was a 6-foot, two-hundred-pounder, very big at that time for a hockey player. Howe had already caught the eye of the professional scouts (people who gather information about players not yet in professional sports). When he was fifteen, the New York Rangers invited him to a tryout camp. The camp director, though, was unimpressed. He felt Howe was too awkward and would not make it in the major leagues. Despite this rejection, Howe landed a tryout with the Detroit Red Wings the next year. Jack Adams, coach and general manager of the team, was definitely impressed by young Howe and signed him to a contract. Howe, then seventeen years old, was assigned to the Red Wings' minor league farm team in Omaha, Nebraska. He had an excellent season, and the next year he was given a shot at making the major-league club. He made the Red Wings, and in his first game gave a sample of what was to come. He scored a goal, skated tirelessly, and had perfect control. His goal came in the second period, and he literally powered his way through the players from the blue line to make the goal. It took Howe three seasons to "mature" as a professional. He scored a total of thirty-five goals those first three years. From that point on, Howe was a consistent scorer. Starting in 1949 and 1950, Howe was one of the NHL's top scorers, which he continued to be for two decades. In 1950, though, Howe's career almost came to an abrupt end. In the first playoff game against the Toronto Maple Leafs, Howe collided with Toronto's Ted Kennedy and flew head first into the sideboards. His skull was fractured and he suffered a concussion (a brain injury caused by a hard blow). He also had his cheekbone and nose broken. In the hospital, surgeons had to operate to relieve the pressure on his brain. He was in critical condition for days. The next season Howe came back. The question was, would he still have the same fire and aggressiveness that he had before? Howe responded by playing in every game and by leading the NHL in goals, assists, and total points that season. Leading the league in scoring became a regular occurrence for Howe. He won the scoring title six times. He was selected the NHL's Most Valuable Player six times. Howe's development as a star also led to his team's development as consistent winners. From 1949 to 1955 the Detroit Red Wings won the league title seven straight times, and they were Stanley Cup playoff champions four times. In 1951 Howe met Colleen Joffa, and in 1953 the two were married. They would eventually have four children: Martin, Mark, Cathy, and Murray. The boys soon became involved in youth hockey. Throughout his career Howe was a supporter of self-defense on the ice to avoid getting hurt. He was a feared figure on the ice. He had sharp elbows and a quick stick. Some thought him to be sneaky and players kept out of his way. Howe was everything one would expect the ideal athlete to be: he was intelligent, demanding, and hardworking. He was not a person to take any abuse from other players. If they tried to intimidate him, they ended up on the "short end of the stick." His number one goal was to play good, hard hockey. With the flying elbows and flying pucks that come with hockey, and no helmets at the time, facial cuts and stitches were common in the game. Howe estimated that he had received three hundred stitches in his face. Howe surpassed Maurice "Rocket" Richard's (1921–2000) scoring record in 1963. By the time he retired from the Red Wings in 1971 at the age of forty-three, he held the records for goals, assists, and total points. He also had the record for most games played. He accepted a job in the team's front office. But in 1973, when the Houston Aeros of the new World Hockey Association (WHA) signed his sons Marty and Mark, Howe asked about joining them. Playing on the same professional team as his sons had been a dream. He got himself back into shape and returned triumphantly, scoring one hundred points, winning the league's Most Valuable Player award, and leading his team to the WHA championship. Howe continued to play in the WHA through 1977. He moved to the Hartford Whalers and when that team was combined into the NHL in 1978, he was back for a second tour of duty in his old league. Howe's autobiography, And … Howe! : An Authorized Autobiography was published in 1995. He continued to make special appearances playing in charity games well into the 1990s. In September of 1997, at the age of sixty-nine, Howe announced he would play one game, the October 3 season opener, with the International Hockey League's Detroit Vipers. His one-shift stint made him the only professional hockey player to play in six different decades. The Howes continue to be involved in charitable activities and live an active lifestyle. In 2001 the couple was honored when a school in Abbotsford, Canada, was named the Colleen and Gordie Howe Middle School. In January 2002 they carried the Olympic torch through Detroit, Michigan, for the 2002 Winter Olympics. Best hockey player of all time? When Gordie Howe broke Maurice "Rocket" Richard's National Hockey League (NHL) scoring record, the debate was whether Richard or Howe was the best player of all time. Years later when Wayne Gretzky (1961–) broke Howe's record, the debate was renewed—this time Gretzky versus Howe. The debate still continues. 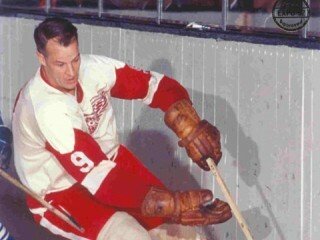 View the full website biography of Gordie Howe.